The native plants of California have incredible diversity and beauty. It seems logical that the plants that grow here naturally should be the ones that would be the easiest to grow. So often we try to help the plants along and fail them with our kindness. Knowing where the plants come from and what conditions will make them thrive can make many of these plants easy choices for including in most any garden. 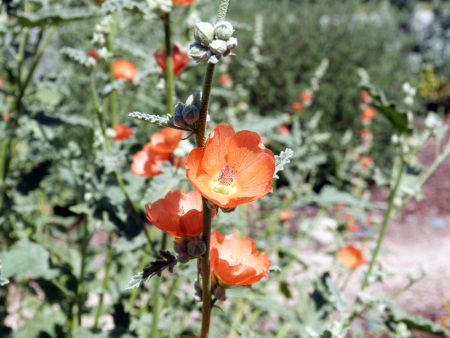 There are 4,839 species of plants native to California. Native plants are very effective at attracting our native wildlife and may provide some limited habitat for increasingly displaced native wildlife species. Within our state there are climatic zones that range from the very wet to the extremely dry, from coastal plants to alpine. With this range of climatic zones there is a huge array of plants to chose from and something that can suit almost any need. Susan Krzywicki is a Landscape Designer and Consultant in California Native Plants who has lives and works in San Diego and got involved in native plant gardening way back in 2003. She was the first paid Horticulture Program Director for the California Native Plant Society, as well as chair of the San Diego Surfrider Foundation Ocean Friendly Gardens Committee. Susan is currently on the Board of Directors for San Diego Canyonlands and is on the Port of San Diego BCDC for the Chula Vista Bayfront. She teaches native landscape design and maintenance at the local adult school for landscape professionals and homeowners.